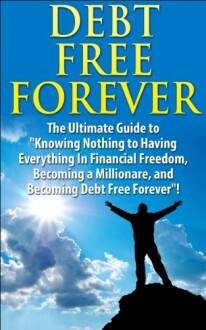 DEBT FREE FOREVER: The Ultimate Guide to "Knowing Nothing to Having Everything in Financial Freedom, Becoming a Millionaire, and Becoming Debt Free Forever"
******Over 50% of today only******, get this Amazon eBook for just $1.99. Regularly priced at $5.99. Read on your PC, Mac, smart phone, tablet or Kindle device. You’re about to discover proven steps and strategies to get you out of debt, help you stay out of debt, and then lead you to financial stability. This three step process is essential. This is because, much like anything else you do in life, you should not stop at the halfway point. And that is what getting out of debt really is! The other part of being debt free is to become financially stable, so much so that you can live a fulfilling life, afford an adequate lifestyle, and be free from the limitations that your current financial status, shackles you in! All there is to becoming debt free is knowing what has worked for hundreds of debt ridden consumers. Learning to tweak what works to fully fit your situation. Then, following through with your personalized debt free road map. And making sure you do not repeat the mistakes of your debt ridden past! Before you can determine what type of plan will work for you, first you need to determine the reasons you got into debt in the first place. Be absolutely honest with yourself here! This is because, the efficacy of the plan you utilize, is determined by the accuracy and truth of your assessment.